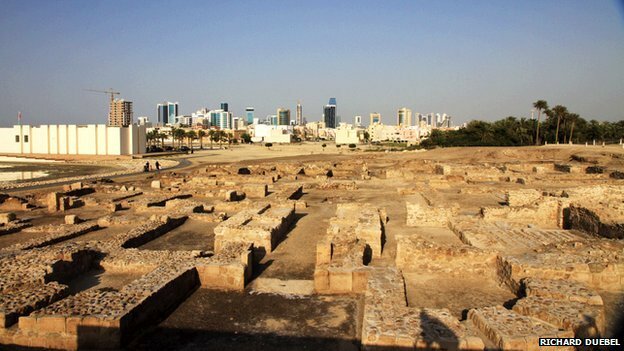 Saar (Bahrain): Excavations are shedding light on one of the oldest trading civilisations. 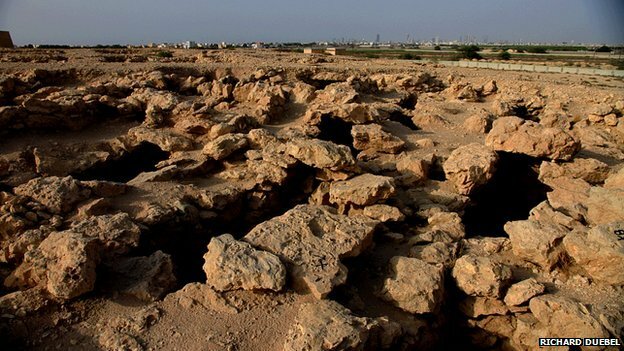 The site in Bahrain, thought to be the location of the enigmatic Dilmun civilisation, was recently discussed at a conference in Manama, the Gulf nation's capital, organised by the UN's educational, scientific and cultural body (Unesco). "This site has provided a lot of information about daily life," he explains. "This has enabled us to compare finds made here with objects unearthed at other locations on the island. It is evident that this city and graveyard date back to the early Dilmun period." Dilmun, one of most important ancient civilisations of the region and said to date to the third millennium BC, was a hub on a major trading route between Mesopotamia - the world's oldest civilisation - and the Indus Valley in South Asia. "For 4,000 years this site was underground so it was sheltered," he says. "Now after excavation, it is exposed to the elements. We have no immediate plans to carry out further excavations. 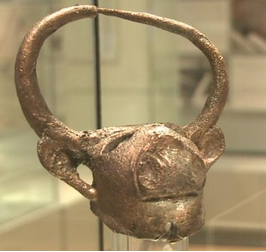 We want to protect the site and to interpret what we have unearthed for visitors." The Saar site is far from being the most significant relic of the Dilmun era. 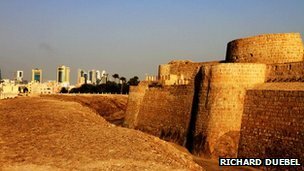 On the northern tip of the island, archaeological expeditions have uncovered seven successive levels of settlements at the Qal'at al Bahrain (the fort of Bahrain). 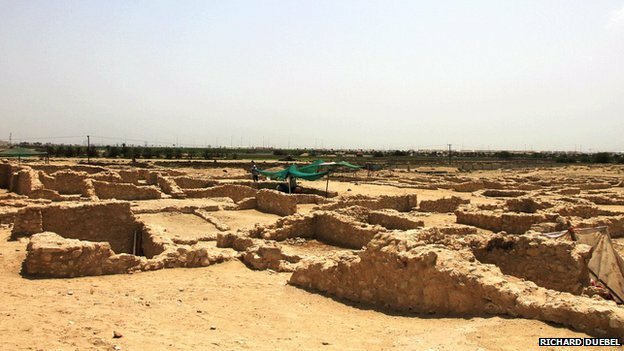 Under the oldest and most extensive fort, three consecutive Dilmun cities as well as a Greek city dating back to 200 BC have been unearthed. On the other side of the central altar, a flight of carved steps leads down to a pool, a deep, stone-walled well built over one of the numerous underground springs where one of three principal Sumerian deities - Enki, the water-dwelling god of wisdom - supposedly lived. But as Abdullah Hassan Yehia, the keeper of the Qal'at al Bahrain, explains, the fertile nature of the island encouraged more than just agriculture (Dilmun was famed for its vegetable production). There is strong evidence of religious practices and beliefs that can be compared with those in other advanced societies of the time. "The belief system here has a lot in common with those of Mesopotamia and ancient Egypt," he says. "Belief in the after-life is shown by burying the dead with possessions such as tools, food, drinking vessels and gold. We've even found weapons." Abdullah Hassan Yehia also explains that the Dilmun merchants had a monopoly of trade in copper, a precious commodity which was shipped from the mines of Oman to the cities of Mesopotamia. But he debunks the theory that Bahrain may have been used by prehistoric inhabitants of the Arabian mainland as a cemetery. The island has approximately 170,000 burial mounds covering an area of 30 square kilometres or 5% of the main island area. The majority of the burial grounds date back to the second and third centuries BC but some are as recent as 2,000 years old. The oldest and largest burial mounds, referred to as the "Royal Tombs", are found at Aali and measure up to 15m in height and 45m in diameter. Archaeologist Salman Al-Mahari agrees: "There were a number of large population centres on the island. We have calculated that there would have been a significant number of deaths of both adults and children who would have been buried here," he says. This sort of debate is exactly what Khalifa Ahmed Al Khalifa, assistant director of programmes at the Arab regional Centre for World Heritage is keen to encourage. "There has been a lot of academic work carried out over the past decades," he recaps. "The idea is to simplify and interpret all this academic information so that local people and international visitors can grasp the importance of our heritage." Using Saar as an example, he continues. "It includes houses, restaurants, commercial outlets, a cemetery and a place of worship. These are all part of a modern city." "One of the characteristics of Saar are its honeycomb-shaped burial complexes. This is the sort of thing that people find fascinating," he adds. "As long as it is presented in an easily digestible way." While academic research continues into life 4,000 years ago in Dilmun, with an emphasis on trade, diet, gods, pottery and other industries as well as local burial customs, there is now a focus on making everything interesting to the layperson. "It's quite a challenge that we're facing," says Khalifa Ahmed al-Khalif. "But with the help of new technology we'll be able to place Bahrain on the [ancient] global map."